Good place to stay. Clean and comfortable. Advanced budget hotel. Friendly, endeavoured and patient staff. Very recommendable. Upstairs Wi-Fi needs improvement. Hotel Amax, New Delhi: Staff was Beyond Great! Lots of Hot Water. Room was Large and Clean. The Restaurant had Good Food at a Good prices.- They arranged an Airport Pick Up. The Travel Desk was good also - The room price is below average value (There is a 25% room tax added on to online price) - The Biggest Drawback is the outside noise. Dogs Barking, Horns honking and Folks Yelling till late at night. 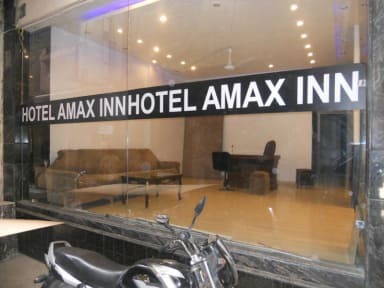 -- I would recommend the Amax Hotel. Very good staff. Always super helpful. The hotel is a bit of walking, further in the back of the long street when coming from New Delhi Station but I can imagine therefore "a little quieter" than the other hotels further in the front. Arakashan Road is also a better choice than Main Bazaar Road regarding noise to get a good sleep, although there is noise everywhere in that area, still it is a good area for backpackers because you can buy all necessary stuff nearby and can walk to New Delhi Station easily. Good hostel but really busy noisy and crowdy area: middle of the oldest city center. Close by the NEW Delhi railway station. Hostel is hard to find for the first time, also difficult to refind it again. Staff is uber kindly!! Hot water was not enough, Room was cold, Blanket was not clean(I asked a worker to change the blanket, but he said "It is clean. Or you can use a cover of blanket". So I received a clean white cover, but it was wet. ), Smell was not good, I could not use a hair drier because they have the only one, There are bad people in the small road to hotel(Someone poured smoke on my face when I passed. It is not a fault of this hotel, but I think this region is not safe), The tower was too old.